I am so happy that Ink Road Books invited me to take part in the T is for Tree* book tour. This is an A, M, A, Z, I, N, G, - AMAZING! novel about friendship, and the hardships that children and teenagers with disabilities face. "Eddy knows he's not like other teenagers. He doesn't look like them. He doesn't think like them. Eddy's not even allowed to leave his bedroom - except on shower day. He doesn't know why: all Eddy knows is that he's different". Eddy was abandoned by his mother, leaving his Grandma Daisy to look after him - only after twelve years, you can tell she is tired, she doesn't like that she has been left to deal with her 'waste of space' grandson. The little time she spends with Eddy, is spent shaming him for being different, calling him dumb, and inspecting the tidiness of his bedroom. All Eddy knows of the world, is what happens outside of his bedroom window; the children playing in the street, people going about their daily business, and the bullies that taunt him whenever they pass by the house. That is until a red van pulls up next door, and Reagan moves into the bedroom right across from his. Through their opposite windows, and a tree conveniently located right in the middle the pair soon become fast friends and she drastically changes Eddy's life forever. Though it took me a while to get into, once I got in I was hooked - I read it all in one day and I am impressed with how the story develops. The short chapters make it easy to read and act as little snap shots of Eddy's day to day life. I would have liked to see parts of this novel written in the first person, as it would have given a better insight into how Eddy felt about certain situations. I love that Greg Fowler was not afraid to tackle a number of difficult topics within his novel. I felt very sad for Eddy when we first met him, he knows he is different, he knows that he is not like the other children in the neighbourhood, all he wants is a friend. We see the abuse and the abandonment from his point of view, a point of view that doesn't really know any better. T is for Tree gives us the unique stories of those that deal with disabilities - not just the people that have the disability, but the people around them - it often takes someone special to notice another person's light, and that is exactly what we get. The language used really worked, and fit well with the characters that had been portrayed. Set over five years, T is for Tree is absolutely life affirming and shows that it really is the little things that matter. I also really love that the tree is a focal point throughout the entire novel, and the ending was a welcome surprise. 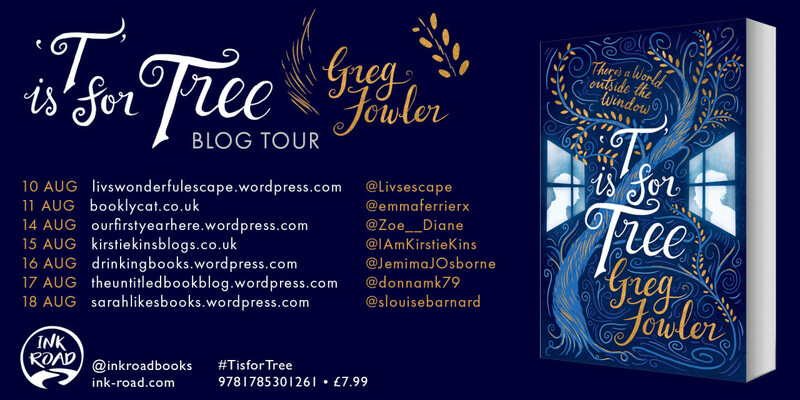 T is for Tree is definitely a great novel, and I would recommend it for anyone that is a fan of, Emma Donoghue's - Room, R.J Palacio's - Wonder and Nicola Yoon's - Everything Everything. You can buy T is for Tree on Amazon, Book Depository, and all other places that sell books. *This Novel was provided by Ink Road books in return for a non-bias review. All thoughts and opinions are my own. Affiliate links have been used in this post. Please see my disclaimer for more details.